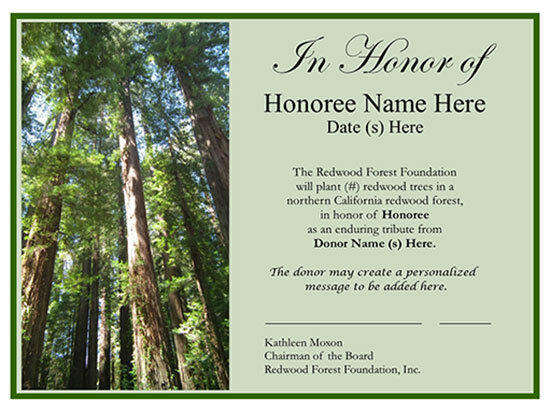 Donate and design your redwood tree certificate online. If you prefer, you can mail a check for the designated amount to RFFI at PO Box 12, Mendocino, CA 95460. Please include the name and address of the certificate recipient and a way to contact you for certificate review and approval. This redwood reforestation program grew out of our highly successful Redwood Rescue Project which saved thousands of baby redwood trees from destruction. RFFI is especially proud of our young philanthropists who are leading the way for the next generation of conservationists. Join business that honor clients and employees by planting redwoods in their honor. Any donor planting two or more redwoods will also become a RFFI member and will enjoy the benefits associated with RFFI Membership. Plant a Redwood to commemorate any occasion. 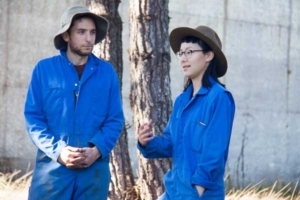 The Redwood Forest Foundation will plant young redwood trees in your honor, or in honor of a friend or loved one, in a redwood forest in northern California’s Redwood region. The Honoree receives an attractive 8″ by 11″ certificate suitable for framing with a customized message acknowledging you as the donor. These enduring gifts are suitable for any occasion. Many families, friends and businesses have redwoods planted to honor loved ones, family and employees. Your gift supports RFFI’s redwood reforestation program. Over 95% of America’s old-growth redwoods have been cut with devastating consequences to the forest and its inhabitants. Your donation helps to plant young redwoods in forests in northern California. Your support is restoring redwood forests that support biodiversity and address climate change. You will be able to design a certificate that we will send to the Honoree(s) or their family. Some of the most generous gifts and moving tributes have been made by or in honor of altruistic young people. Read about the contributions of these young philanthropists. For a donation of $45, the Foundation will plant a single tree for you, a friend or loved one. For donations of $50 to $1,000, RFFI will plant from 2 to 200 trees in your honor or for a friend or loved one, and you will become a RFFI member.